The move by the municipality of Beit Shemesh to utilize empty classrooms for chareidi students in an otherwise secular school has touched off a furor, as secular protests turned disorderly and the Education Ministry issued an order on Tuesday to close down the school. The ministry’s closure order in effect leaves more than 200 chareidi students without a suitable place to study. The Beit Shemesh municipality decided to divide the Language and Cultures school after years of requests for more classroom space were denied by the Education Ministry. Some three years ago, the Mishkenot Daat school for chareidi girls, which belongs to the Chinuch Atzmai network, sought permission to take over part of the classroom space in the Language and Cultures building, but they were turned down by then Education Minister Gideon Saar. Administrators of Language and Culture were repeatedly invited to join city council discussions to work out an amicable solution to the problem, but failed to show up for meetings. It should be noted that the building was largely empty. 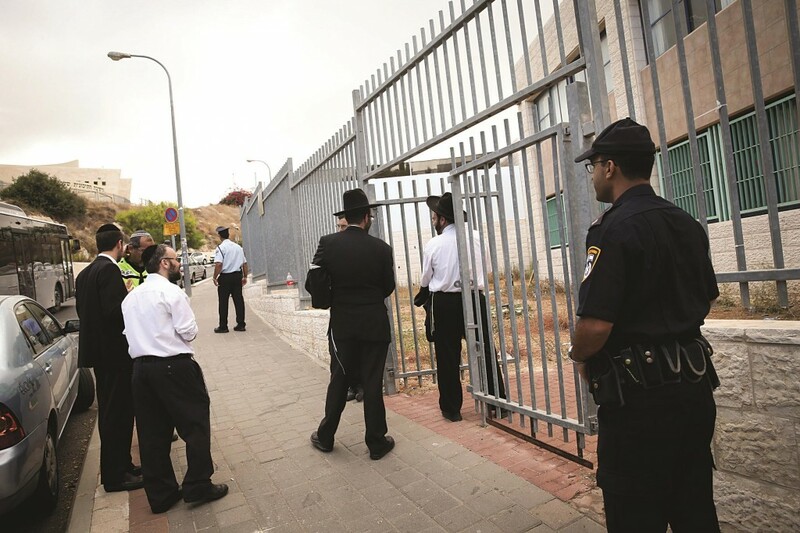 The 144 pupils who attend the school are bused in from the older part of the city of Beit Shemesh, while the building is located in a predominantly chareidi neighborhood. The building was given to the school a decade ago by then mayor Danny Vaknin in an effort to dissuade chareidim from buying apartments in the neighborhood, a plan that did not work. On the eve of the opening of the new school year, September 1, the mayor, along with Councillors Rabbi Yeshaya Erenreich, who is responsible for educational affairs in the city, and Rabbi Moshe Montag, head of planning and construction, decided to end the chronic overcrowding by acting unilaterally. On Sunday, workers divided the school so that both schools could co-exist in the same building. There was plenty of room. There were 144 pupils registered at the school whose building has a capacity for 500. Some 210 students from Mishkenot Daat arrived for the first day of classes. Their portion of the newly partitioned building contains 6 classrooms on 500 square meters, and no administrative offices. The 144 Language and Culture students retained the lion’s share: 1,200 square meters containing 6 classrooms, administrative offices and an auditorium. City officials noted that the building is municipal property, and it is the legal owner, with the right to dispose of the property as it sees fit, in the public interest, as is protocol in all cities. However, the school is operated under the supervision of the Education Ministry, which insists on having the final word. Secular protesters attempted to knock down the partition that the municipality had erected to separate the two schools, and police had to be called in to restore order. They even arrested one secular councilor for disorderly conduct. Beit Shemesh suffers from a chronic lack of classroom space, with many schools having to suffice with caravan-style mobile structures in which to hold lessons. Mishkenot Daat, which has a total enrollment of 900 students, had suffered from inadequate space for several years and its courtyard is full to the capacity with caravans. This article appeared in print on page 1 of the September 3rd, 2014 edition of Hamodia.